So You Think You Can Mom? : Teen Beach Movie Summer Jam Event at Club Penguin! 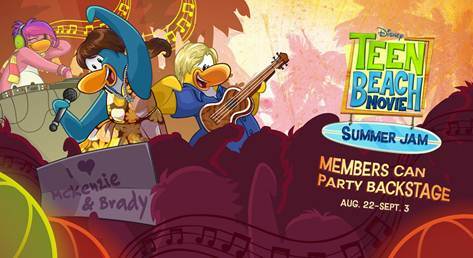 Teen Beach Movie Summer Jam Event at Club Penguin! My favorite penguins are taking to the beach for the coolest jam of the Summer! Starting today, Disney’s Club Penguin is keeping the summer fun going with the “Teen Beach Movie” Summer Jam event. Club Penguin Island has transformed into a surfer's and biker's paradise and my daughter can't wait to have her penguin hang out at Big Momma's with the rest of the "Teen Beach Movie" crew!!! Disney’s Club Penguin, the #1 virtual world for kids, keeps the summer fun flowing with the ultimate summer party - “Teen Beach Movie” Summer Jam event. “Teen Beach Movie” is the #2 movie in cable TV history in Total Viewers (13.53 million) and the #2 cable TV telecast of all time across Kids 2-11 (8 million), Kids 6-11 (6.4 million) and Tweens 9-14 (5.11 million), behind only "High School Musical 2." And to keep the party rolling, Club Penguin Island will transform into a surfing and motor-biking paradise from August 22 to September 3, featuring guest performances by penguins inspired by popular "Teen Beach Movie" characters Brady and McKenzie. While they surf the waves and hit the open road, members can dress up like their favorite characters from the film including McKenzie, Brady, Lela, Tanner, Cheechee and more. Sporting their cool costumes, penguins will be able to chill out by the campfire, play with friends at the beach and even rock out with the penguins inspired by Brady and McKenzie while they perform on stage at the beach hangout in "Teen Beach Movie" Big Momma’s. Members will also have exclusive backstage access to the party and get the chance to receive an exclusive autographed background from the McKenzie and Brady-inspired penguins. · Everyone can chill out with friends at Big Momma’s, make a splash at the Water Park, shoot the curl in Epic Wave and members can become easy riders on the Highway. · In tiki shacks hidden around the Island, all players can find and collect seven different beach items like a ukulele, campfire marshmallow, and flower lei to complete their groovy beach attire. · Members can get their igloos summer-ready with items like a pool, a diving board, jukebox and a lifeguard chair. · Members can receive an exclusive summer igloo by playing in the My Penguin app.